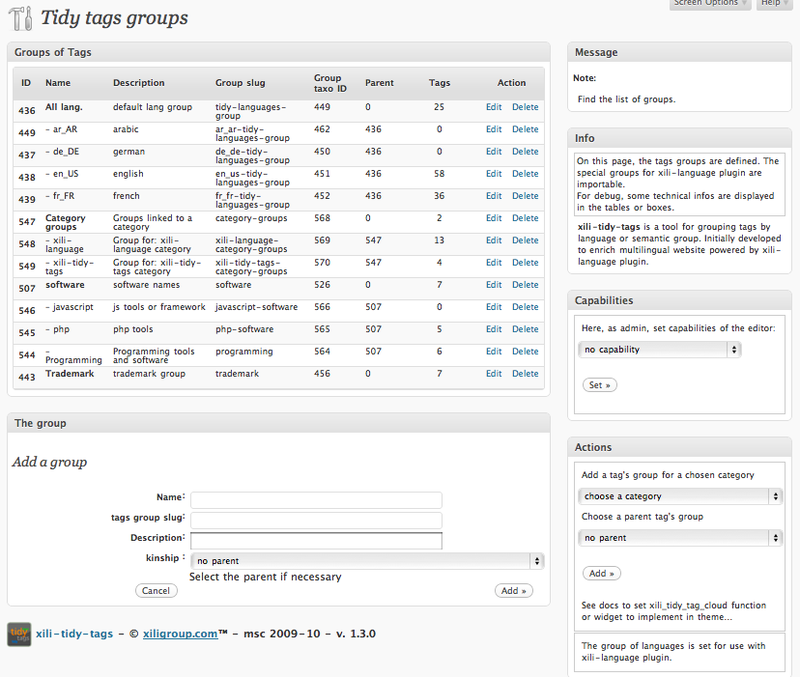 xili-tidy-tags is a tool for grouping tags by semantic groups or by language and for creating tidy tag clouds. Compatible with WP 3.0 both in mono or multisite mode. 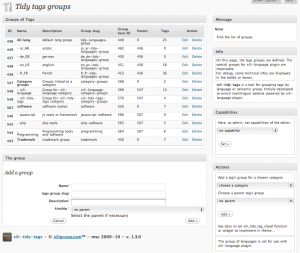 xili-tidy-tags is a tool for grouping tags by language with xili-language plugin for multilingual site and for creating tidy tag clouds. By instance to present only tags in english when the theme is in english because the post or the current category present texts in english. Capabilities updated for editor’s role. 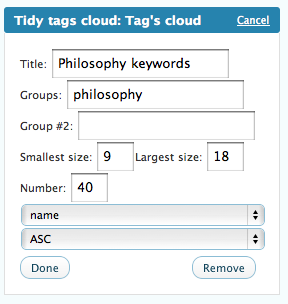 In tags cloud widget , new option to display tags as list added. * Add sub-selection by tags belonging to a group – or not belonging to this group (suggestion of David). 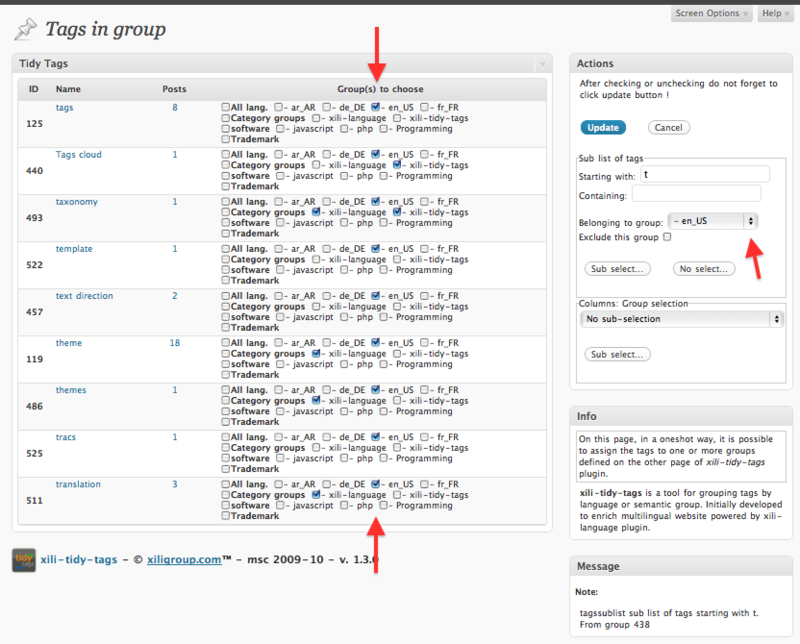 With this way, it is possible to see tags selected in one group and (optionally the others there are not). The sub-selection by starting or containing letters remains. The columns of group are now sorted and grouped (parent and childs). * Now uses Walker class to sort groups in UI. With these parameters, only tags from subgroups ‘trademark’ & ‘software’ are displayed in loop with each post (use slug of terms). Wordpress delivers 2.8, xiligroup dev ships xili-tidy-tags 1.0 : A new shortcode is added to insert a group of tags inside a paragraph of a post as explained here. 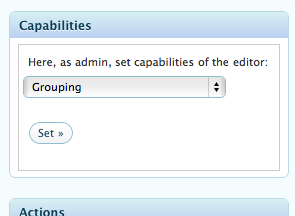 Add capability management for editors role grouping – and setting -. Set by administrator role. When creating tags in post edit UI – this new tag is grouped to default post’s lang if xili-language is active and if this tag is not already grouped in a language group. 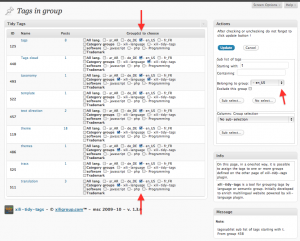 add features to modify kindship of tags group, now allows multiple cloud widgets – see note in installation. 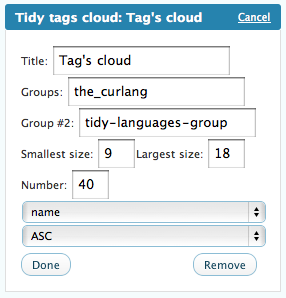 With big tags list in admin UI, select tags starting or containing char(s) or word(s) – possible to split cloud in sub clouds via &offset= et &number= in the var passed to the `xili_tidy_tag_cloud` – .po file completed. The tidy tags cloud widget is available. And the template tags `xili_tidy_tag_cloud` (useful for theme’s creator) is now more powerful with more args as in `tag_cloud or get_terms`. 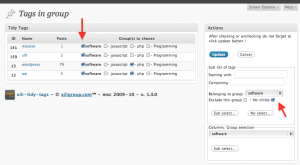 It is also possible to create tag’s group according category in three clicks – see second example in installation and screenshots. « Frases de cine » with more than 200 tags. Compatibility with WP 2.9 ? Today, with current dev release, xili-tidy-tags appears to be compatible with 2.9.2. 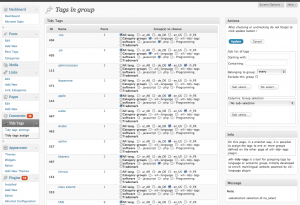 1. the admin settings UI : tidy tags groups. 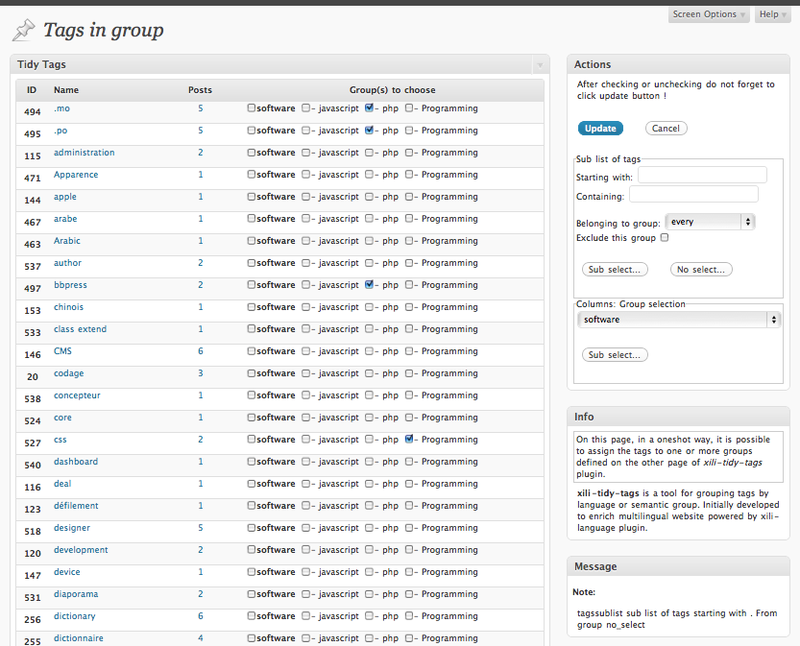 2. the admin assign UI : table and checkboxes to set group of tags. 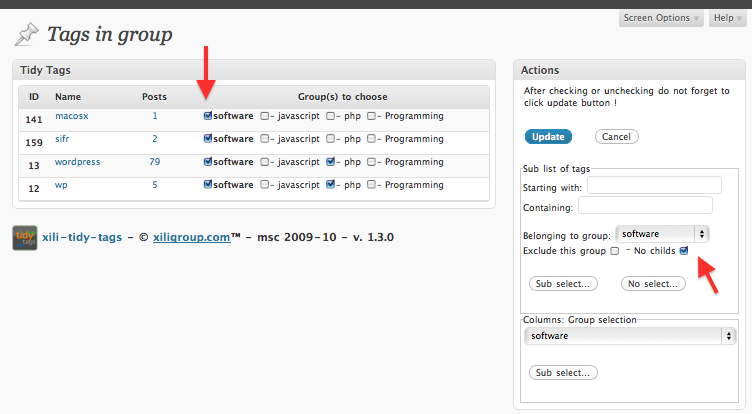 3. the admin settings UI : table and checkboxes to set group of tags : sub-selection of groups. 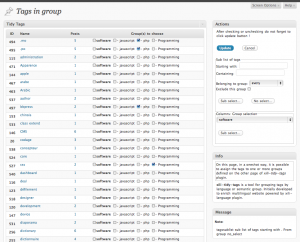 the admin settings UI : table and checkboxes to set group of tags : sub-selection of groups. 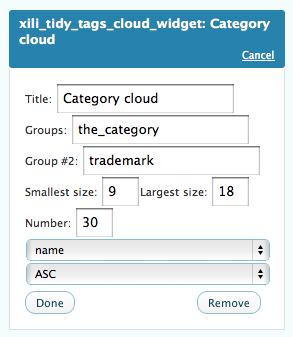 4. widget UI : example where cloud of tags is dynamic and according categories and include group trademark. 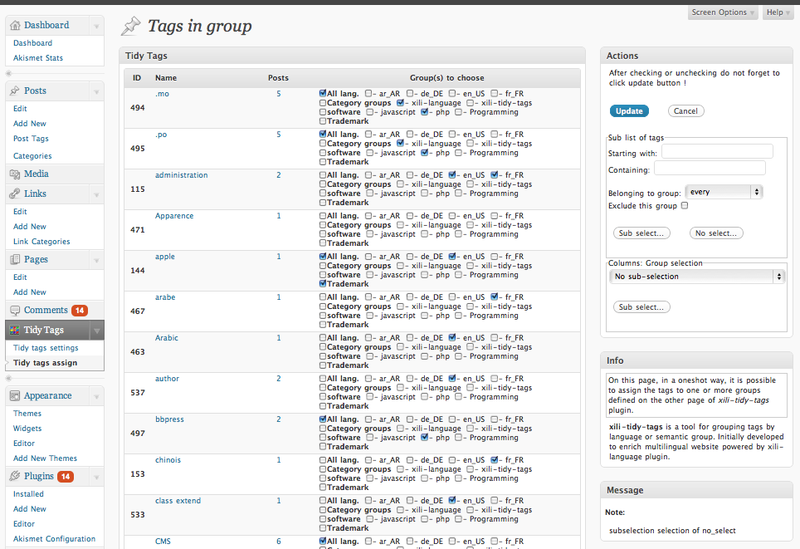 5. widget UI : (xili-language plugin activated) example where cloud of tags is dynamic and according language. 6. widget UI : display a sub-group of tags named philosophy. 7. the admin assign UI : with big tags list, it is now possible to select tags starting or containing char(s) or word(s). 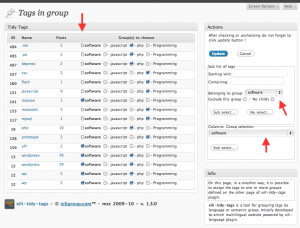 8. the admin assign UI : here only the group “software” – a parent group – is selected and all tags of his childs are shown. 9. the admin assign UI : here only the group “software” – a parent group – is selected and only tags of this group are shown (No childs checked). = 1.3.0 = add sub-selection by tags belonging to a group. Now uses Walker class to sort groups in settings UI. = 1.2.1 = fix quick-edit tag function. = 1.2 = fix `xili_tidy_tag_cloud` sort and order. 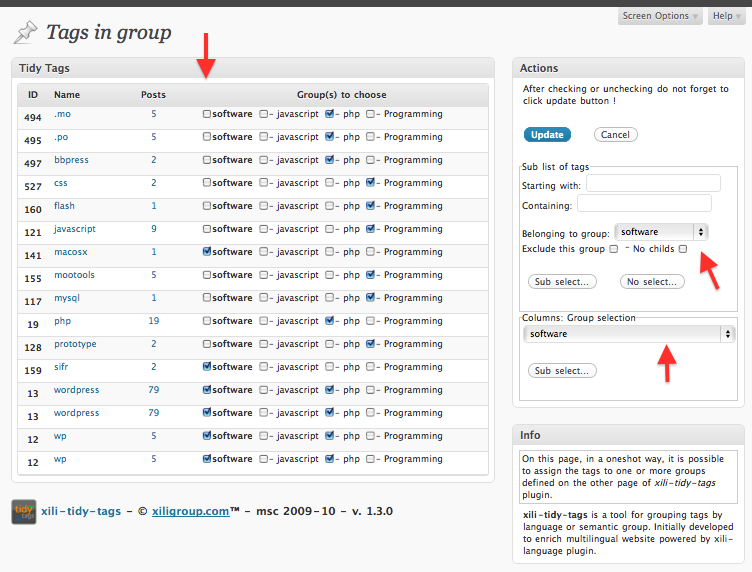 = 1.1 = In loop, the template tag `the_tags` named `xili_the_tags` is now able to show only tags of sub-group(s). * compatible with WP 2.8. Ce contenu a été publié dans xili-tidy-tags, avec comme mot(s)-clé(s) multilingual, plugin, tags, wordpress. Vous pouvez le mettre en favoris avec ce permalien.